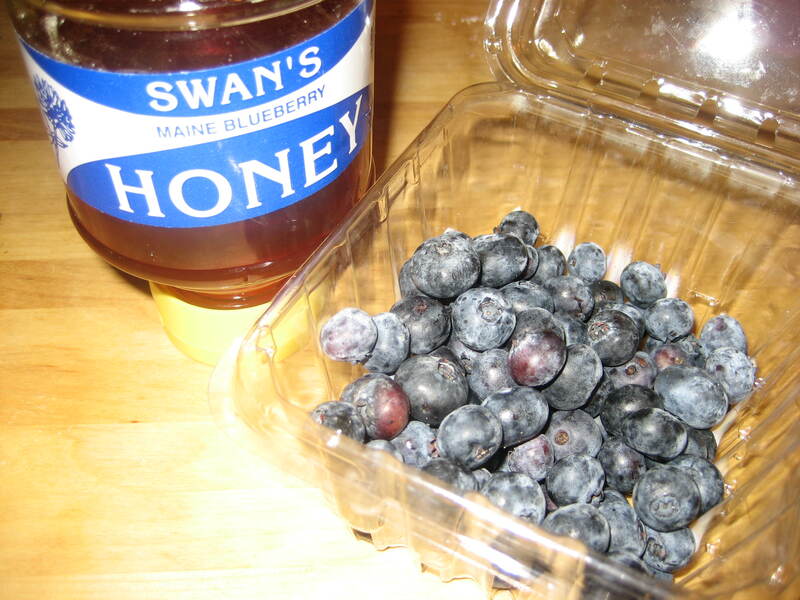 The two biggest food items I took away from Maine were blueberries and honey. One of the winemakers we visited noted, “We’re in Maine, so there’s practically a law that blueberries need to be in everything.” Both were everywhere. I was very disappointed to learn when we got there that Maine’s blueberry season starts in August, meaning no fresh blueberries or blueberry picking for me. But I still tried to indulge when I could–blueberry jam, blueberry ice cream, even blueberry butter at the Lucerne Inn! I did pick up some blueberry honey at the Blue Hill Food Co-op, but stayed away from the blueberry syrup (I’ll stick with good old maple syrup, thank you). So, when I got back to Brooklyn, I still had blueberries on the brain. Plus, I recently read Romancing the Bees blog post about honey cupcakes. I was inspired. Honey’s tasty and blueberries are pretty awesome, how good could they be together? So I experimented and whipped up some pretty tasty blueberry cupcakes with blueberry honey icing, kind of a last goodbye to our vacation in Maine. Our trip to Maine was extraordinary–food, hiking, mini golf, canoeing, wine, beer, more food. Yet, no matter how amazing a vacation might be, there’s nothing like being back home, in your own (steamy!) apartment, sleeping in your own bed. There are always things I miss about Brooklyn when I’m away…but that’s not to say I won’t miss things about Maine too. No matter where I am, I try to explore the local scene, and vacation is certainly no exception. I’ve been spending my week in Maine eating, drinking, hiking…and maybe eating and drinking some more. 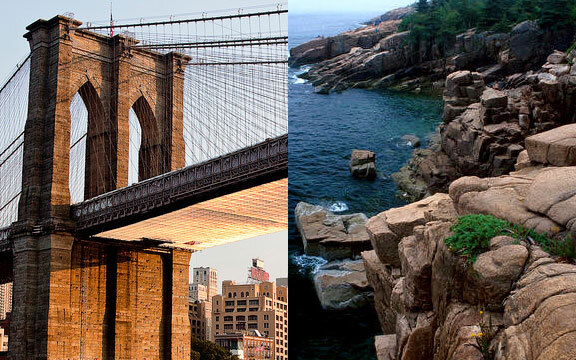 While not Brooklyn local, these great finds are certainly worth sharing, should you have a trip planned to Maine, or maybe want to get one together after reading about these great restaurants, breweries and yes, even wine! Brooklyn is beautiful, but everyone needs to get away once in a while, even me. Our aunts were kind enough to give us a week’s stay at a family cottage up in Maine, and two years later, we’re finally cashing in. The cottage is beautiful—a 120 year old pine and spruce cottage, sitting on the lake, in the middle of the woods. No phones, cable and no internet (but a creative internet setup thanks to a healthy cellular connection). We’re about an hour north of Bar Harbor, so there’s plenty of good food (read: seafood) in the area, but I love vacationing where I also have the opportunity to cook. As we were packing, I thought nothing would be better than enjoying tea and fresh scones for breakfast in our little rustic cottage. So I brought some of my homemade strawberry rhubarb jam and planned to make scones and fresh cream at the cottage.